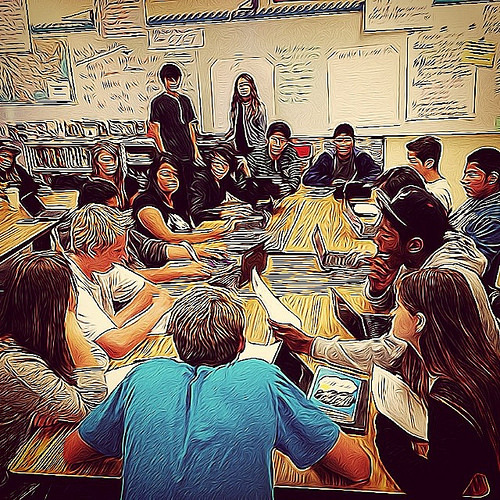 I have been using Socratic seminar as a method of assessment of student learning in my classes for some time, but last year I started asking my students to complete a simple reflection after the seminar and hand it in the next day. As a result, I really have a window into what my students are learning in the seminars. In the past, I assigned the essential question for the seminar, but I have learned to give control over formulating the question to the students. My AP Lit students recently had a successful seminar discussion on Shakespeare’s King Lear and Jane Smiley’s A Thousand Acres. The question they designed was, “Was justice served in the end?” Justice (and its lack) are a major theme of the play. Students were able to pull in ideas about what happens when the natural order of things is upended and people are not compassionate for others. Every student was able to contribute thoughtfully to the seminar itself, but when I read their reflections, I understood exactly how much thinking and learning had taken place. It changed my opinion on what justice is. I sort of went in not having my own clear definition of what “justice” meant in King Lear, but I thought we’d all be thinking on the same track. The range of definitions, all of which influenced my own, surprised me. I never thought of justice being done to someone in that way, nor did I see justice as when a character finally realized his or her mistake. After the discussion, it influenced my own definition because I took into account that a when character realized their mistakes it was because enough harm had been done to others around them or to them themselves. Changing views of the definition of justice were a theme in the reflections. 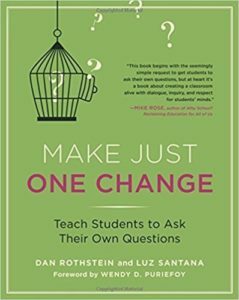 In most cases, students said that another student’s comment had changed their minds, made them think about things in a different way, or influenced their thinking in other ways. [Student 1] said something along the lines of … “justice didn’t care about individuals, it just wanted the natural order of things restored.” I never really thought of this in terms that the individuals didn’t matter. Another student shifted gears based on a comment another student made. Throughout the seminar, I mostly considered the sense of justice as individual characters. I thought about the evil characters and their tragic ends. However, [Student 2] pointed out that we should instead inspect the text as a whole and look at the entire book in order to see if justice was served or not. This actually changed the entire course of what I had in mind of the texts and the Socratic seminar. It changed my viewpoints as I started looking at the natural order and the essence of what role [the] god[s] played in the texts. It always intrigues me when a single student’s comment shows up in the reflections of several peers, and in the case of this comment, the student, whom I have called Student 3 throughout this post, is one who has made excellent progress with each successive seminar. It is exciting to me that his comments were so influential in the thinking of his peers this time. [Student 3] said that justice isn’t just about the punishment, but also includes a revelation. I thought that this was interesting, since I usually tend to think of justice as being a punishment to fit the crime. I thought I did really well on this seminar and achieved my goals I set for myself from the last one. Next time I think I should try to include more people in the discussion by asking questions to them. I think I should ask more clarifying questions to the group in order to dig deeper into the text, and to become more specific on certain topics. Before this Seminar … although I knew there were two ways which justice can serve on bad people, I couldn’t come up with all of them. However, after listening to what other people said, especially [Student 3] and [Student 4]’s words, I was inspired by their words and generated lots of innovative ideas during the seminar and eventually spoke a lot because I had so many ideas. I could almost feel this last student’s excitement. His reflection was much longer than his previous ones, and I could tell the discussion had excited and invigorated him. He was inspired. When it was suggested that we define the word justice, I never thought of different meanings behind it. I mean I realized that everyone had their own opinion, but didn’t realize it would be from a totally different definition and meaning that would change the way to interpret the play and it’s [sic] characters. [Student 3] said that the way he interpreted justice was justice was served if people learned from their mistakes. I never thought of justice as learning from their mistakes. Although I believe justice is that they get caught, pay for it (karma), and go on with life, I still don’t necessarily agree with him, but it is an interesting point of view. It changes everything, when interpreting the book from [Student 3]’s definition of justice and makes both books seem like less justice was served. I think we have been doing a great job with structure. This time we started pretty weak jumping everywhere, but after the first few comments, I sorted things out and we found a structure that worked for this seminar. Actually, structuring a seminar without restricting it too much is not easy. I think it should be our task prior to the seminar to imagine how it could be structured based on the question. I still think we have side arguments and sometimes we went off topic. It will be better if we can all try to answer the main points of the questions. Besides, some people always just talk too much and did not let others to say anything, so I think we should acknowledge this problem so that quiet people can speak more. 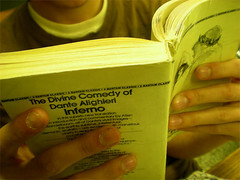 As the teacher, I can see that she is right in her criticism, though the group has made progress in this regard. I know they have more progress to make. So do they. I believe that this was our best discussion yet, in terms of everyone contributing, but I still believe that as a class we have room to grow. But they also know they are getting there. I feel like as a group we made a lot of progress compared to the last seminar. We were able to include everyone in the conversation and for the most part organize its structure or at least set a framework for the topics being discussed. Because we were more organized this time around, the material we discussed was much easier to understand. If I hadn’t asked the students to reflect, I wouldn’t know any of these takeaways. I also think actively setting goals keeps those goals at the forefront during the next seminar. The students in some cases mentioned the goals they made last time and their progress toward reaching them. Last year, a student of mine noted that another student had tried to speak, and he thought that she had been interrupted and shut down. He said he wanted to make sure she had opportunities to speak next time. I suggested on his reflection that he might try sitting next to her for the next seminar to facilitate helping her, and not only did he move his seat for the next seminar, but he sat next to her for the remainder of the year. I did not create the reflection form that I use. I borrowed it from the Greece Central School District (see Socratic Seminar Reflection, and be sure to check out their rubrics, too). I have found their resources helpful ever since Jay McTighe introduced their rubrics for me about ten years ago. Another tool I use in my seminars is an iPad app called Equity Maps. Full disclosure, I am acquainted with the developer. He facilitated Critical Friends training in which I participated at my school, and he showed us this app at that time before it was released. Though my class has more boys than girls, according to the gender distribution in all three seminars my students have done, the girls are speaking more. I can also tell for how long and how many times a student spoke. I can record the conversation and take pictures. I can also make notes as the students talk. I use the notes feature to mark instances of good use of textual evidence, asking questions, building on comments, and making particularly insightful comments. The app has a few limitations, but it works quite well for keeping track of the discussion. The best thing about Socratic seminar is that it completely student-centered. They create the focus question (I step in if they need help), they run and contribute to the discussion, and they reflect on the learning and progress they have made. Students love it. I think they genuinely look forward to seminars, and they take them very seriously as the wonderful learning opportunities they are.